At first glance, soil sampling would seem to be a relatively easy task. However, when you consider the variability that likely exists within a field because of inherent soil formation factors and past production practices, the collection of a representative soil sample becomes more of a challenge. Before heading to the field to take the sample, be sure to have your objective clearly in mind. For instance, if all you want to learn is the average fertility level of a field to make a uniform maintenance application of P or K, then the sampling approach would be different than sampling for pH when establishing a new alfalfa seeding or sampling to develop a variable rate P application map. In some cases, sampling procedures are predetermined and simply must be followed. For example, soil tests may be required for compliance with a nutrient management plan or environmental regulations associated with confined animal feeding operations. Sampling procedures for regulatory compliance are set by the regulatory agency and their sampling instructions must be followed exactly. 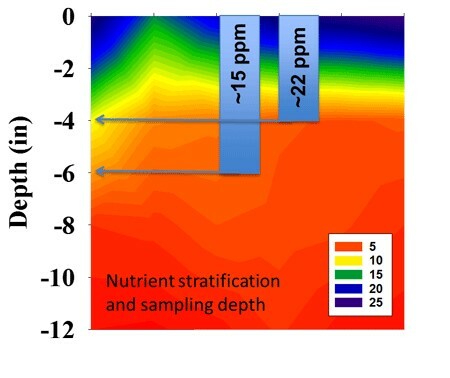 Likewise, when collecting grid samples to use with a spatial statistics package for drawing nutrient maps, sampling procedures specific to that program should be followed. A soil sample should be a composite of many cores to minimize the effects of soil variability. Take a minimum of 12 to 15 cores from a relatively small area (two to four acres). Taking 20-30 cores will provide results that are more accurate. Take a greater number of cores on larger fields than smaller fields, but not necessarily in direct proportion to the greater acreage. A single core is not an acceptable sample. Use a consistent sampling depth for all cores because pH, organic matter, and nutrient levels often change with depth. Match sampling depth to sampling objectives. K-State recommendations call for a sampling depth of two feet for the mobile nutrients – nitrogen, sulfur, and chloride. A six-inch depth is suggested for routine tests of pH, organic matter, phosphorus (P), potassium (K), and zinc (Zn) (Figure 2). When sampling a specific area, a zigzag pattern across the field is better than following planting/tillage pattern to minimize any past non-uniform fertilizer application/tillage effects. With a GPS system available, recording of core locations is possible. This allows future samples to be taken from the same locations in the field. When sampling grid points for making variable rate nutrient application maps, collecting cores in a 5-10 foot radius around the center point of the grid is preferred for many spatial statistical software packages. Avoid unusual spots obvious by plant growth and/or visual soil color/texture differences. If information on these unusual areas is desired, collect a separate composite sample from these spots. 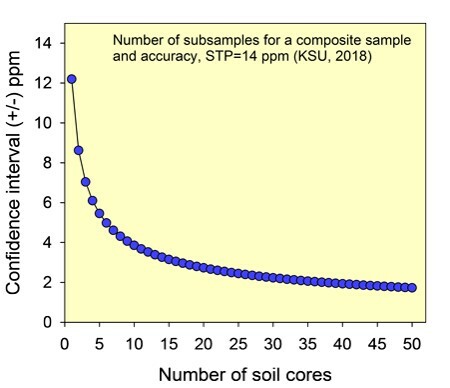 If banded fertilizer has been used on the previous crop (such as strip tillage), then it is suggested that the number of cores taken should be increased to minimize the effect of an individual core on the composite sample results, and to obtain a better estimate of the average fertility for the field. Figure 2. Consistency is sampling depth is particularly important for immobile nutrients like P. Stratification of nutrients and pH can be accentuated under reduced tillage. Soil test results for organic matter, pH, and non-mobile nutrients (P, K, and Zn) change relatively slowly over time, making it possible to monitor changes if soil samples are collected from the same field following the same sampling procedures. However, there can be some seasonal variability and previous crop effects. Therefore, soil samples should be collected at the same time of year and after the same crop. Soil testing should be the first step for a good nutrient management program, but it all starts with the proper sample collection procedure. After harvest in the fall is good time for soil sampling for most limiting nutrients in Kansas. For instructions on submitting soil samples to the K-State Soil Testing Lab, please see the accompanying article “Fall soil sampling: Sample collection and submission to K-State Soil Testing Lab” found in this eUpdate issue. By osunpk in Guest Author, Nitrogen, Phosphorus, Soil Sampling on October 1, 2018 .